One of the greatest challenges of building a cryptocurrency platform is ensuring you create a decentralized system of governance to manage, fund, maintain and expand the project. This key element has been absent in every major currency to date, so the natural response is to create a not-for-profit foundation that is tasked with maintaining the core protocol and promoting the coin, but is not really connected to the coin holders in any meaningful way. This approach has a few issues that have been made evident from the experience of older crypto currency platforms. Current crypto foundations are not related to the currency itself by any mechanism that is included in the protocol and are not designed to outlive early adopters when they lose interest. The foundation then struggles to maintain funding until it implodes and core development of the protocol is left scrambling for funding or depending on charity that can’t be counted on and does not allow for proper budgeting and planning. Donations are also unfair to donors because there are always free riders that benefit from the effort done by others without contributing. Other projects have financed themselves by premining coins or running prelaunch sales, which is not a great solution either because control of the funds is centralized and at that stage it is impossible to quantify the future needs of the project. Through the network of full nodes and the collateral requirement, Axe already has a decentralized network of masternode operators that are heavily invested in the future of the currency, and that as a group can act as stewards of the core protocol development and promotion. We propose a decentralized management system based on the masternode voting mechanism. Masternode operators are not the only ones interested in the success of Axe, but they are the most stable ones because, unlike miners, they can’t reuse their asset for any other purpose or coin. In the budget system, a portion of the block reward is held in escrow by the network itself, in the name of the operators, to be executed in the development and expansion of the ecosystem according to the vote of the masternodes in different budget proposals. These funds are directed to supporting development and promotion of the coin. Masternode operators vote on specific budgets and projects to be funded, thus defining the direction the coin is taking. This is done in a completely transparent way through a public portal where new initiatives are proposed and masternodes can vote on them. Functioning like a decentralized Kickstarter or Lighthouse, the budget can be used for anything that creates value within the ecosystem. This is a 100% decentralized system powered by the masternodes, where budgets are set and paid directly from the blockchain. The blockchain hires core developers in this way and introduces a new concept of paid blockchain contractors, where people work for and are directly compensated by the network, through the decentralized votes of all masternode operators. One advantage of this model is it can survive early adopters. If early masternode operators sell their coins, the new owner can set up a masternode and with it acquire the right to vote on the budgets and projects. This guarantees there is a working system of maintenance as people come and go, making the network capable of sustaining itself on its own without depending on specific actors. Note that if you do not operate a masternode, you may still be able to vote on AxeBoost proposals. See https://www.axeboost.org for more information. The system works as a decentralized voting mechanism set up in the rules governing the blockchain, where budgets for specific projects are proposed, then the masternodes as a whole vote on them. Each project, if it passes, is added to the total budget and paid directly from the blockchain to the person doing the work. This allows Axe to hire core developers and pay them directly after approval of the work in a decentralized fashion. A masternode votes on a proposal (technically a governance object on the blockchain) using the example command “masternode vote yes”, “masternode vote no” or “masternode vote abstain”. The votes then propagate across the network, and are tallied according to instructions followed by the network itself. Budgets under discussion and voting progress can be viewed using the example command “masternode budget show”. A well defined decentralized system of governance allows a cryptocurrency network to endure and survive its original creators. In this way, later generations of masternode operators have a clear way to support the system as defined by the protocol itself, applying wisdom of the crowd techniques and the bond of trust established by the masternode collateral to create a decentralized management system. This creates incredible value within the currency, allowing us to be more agile and compete with other payment systems, such as Bitcoin and credit cards, on a global scale. As the system has developed, a strong team of productive contractors paid from blockchain rewards has arisen and become established. This includes the core development team, escrow providers, news and reporting staff, experimental development labs, partnerships with universities, hiring of marketing and PR firms and integrations with third party exchanges and payment platforms. The market recognizes the value of the stability of the network as a whole, and that the possibility of reliable and sufficient funding results in faster and more coherent implementation of the Axe roadmap and core Axe services. To guarantee long term sustainability of the blockchain, the network keeps a portion of the block rewards back as new blocks are created, with the masternode operators tasked to act as stewards and invest in the maintenance and expansion of the network by voting. This results in faster development and promotion, creating a virtuous cycle that benefits all actors, including miners, masternode operators, investors and users. More importantly, this gives the blockchain itself a self- preservation mechanism that is beyond the control of any individual. Masternodes and miners take 45% of the mining reward each, at the time it is created. The remaining 10% is disbursed monthly by the masternode operators once the results of their votes are tallied, creating the first self-sustaining decentralized cryptocurrency platform organized as a Decentralized Autonomous Organization (DAO). The masternode operators establish a social contract with the network they benefit from and are bound to act as caretakers, dedicating their time, due diligence work and a portion of the network rewards to furthering the ecosystem. This has a ripple effect that benefits all parties involved - especially the end users. The value generated by work done implementing proposals is expected to be greater than allocating 100% of rewards to mining because the network has needs beyond only cryptographically securing the blockchain. The expected result is greater net benefit not only for proposal winners, but also masternode operators, miners and normal users. In fact, the introduction of the decentralized governance budget itself was decided by a masternode vote, making the first distributed decision the actual creation of the system, similar to establishing a constitution. This approach of distributing the normal block reward in a way that considers all critical elements a cryptocurrency needs for its long term viability, e.g. mining, full nodes, development and promotion, is revolutionary as it is done without changing the emission or creating any additional inflation for investors. The network simply distributes the available resources in a way that is of greater net benefit to all parties. Contractors of the blockchain can be developers, outreach professionals, team leaders, attorneys or even people appointed to do specific tasks. Proposals generally begin life as simple pre-proposal forum posts on the Axe Forum, where feedback and suggestions are solicited from the general community. Once the proposal owner decides they have a reasonable chance of passing their proposal, it is created as a governance object on the blockchain. A fee of 5 AXE is associated with this action to prevent spam and ensure only serious proposals make it to this stage. Several tools exist to allow masternode operators to comfortably review and vote on proposals. The net total of yes votes must exceed 10% of the total masternode count at the time votes are tallied in order to pass. If there are more passing proposals than the available block reward can provide for, the proposals with the most yes votes will pass first, creating a cut-off point for less popular proposals. The same process is then repeated every month, and the total amount of Axe available for proposals decreases by approximately 7.14% per year, together with the overall block reward. The community has gathered around AxeCentral as a website to facilitate discussion and voting on proposals formally entered on the Axe blockchain. Other websites, such as Axe Ninja and Axe Nexus are available to monitor progress over time and gather more detailed statistics. Axe Masternode Tool also allows for voting without the need to share masternode private keys with a third party service. Each proposal includes a description of the proposal goals, details of what work will be done and a breakdown of the requested budget. Many proposals also link to their own website or the pre-proposal discussion, or include a video to validate the identity and sincerity of the proposal owner. Discussion on Axe Central occurs below this information, and masternode owners have the option to verify their ownership of a masternode and ability to cast a vote by signing a message from the masternode collateral address. Masternodes can vote at any time, and also change their vote at any time until the cutoff block is mined and voting stops. This occurs 1662 blocks prior to the superblock. After voting stops, the blockchain executes a decentralized tally and validates all votes. Once consensus is reached, the results are broadcast and the budget is allocated soon after in a superblock. Once passed, proposals are able to report back to the network on the Axe Forum or via published public channels and social media. Since it is possible to create proposals that pay out over several months, it is also possible to revoke funding from a project by changing the vote if development or spending of already allocated funds is unsatisfactory. This encourages proposal owners to work honestly and diligently to win the trust and approval of the network. Ongoing discussion and gradual improvement over time results in a close bond between the network and those working for the network in supporting roles. 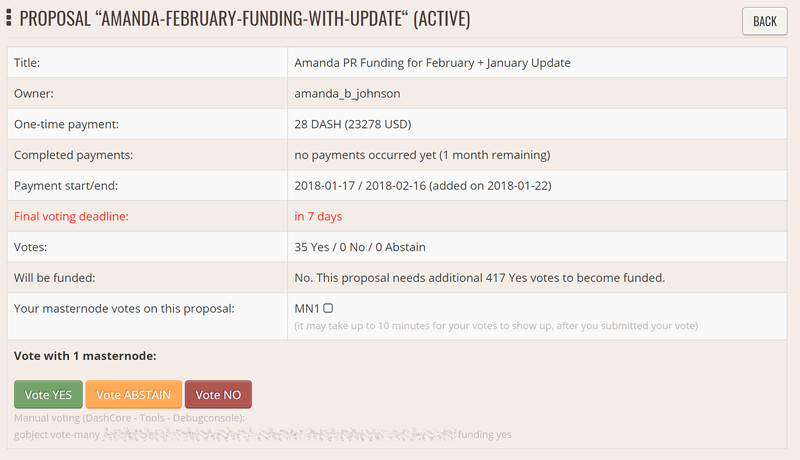 Voting on proposals is updated in real time via P2P messages and stored by Axe in cache files, so current winning proposals and the total allocation of the available budget are always open and visible to everyone. Axe Nexus is a popular site used for to view progress on proposal voting. 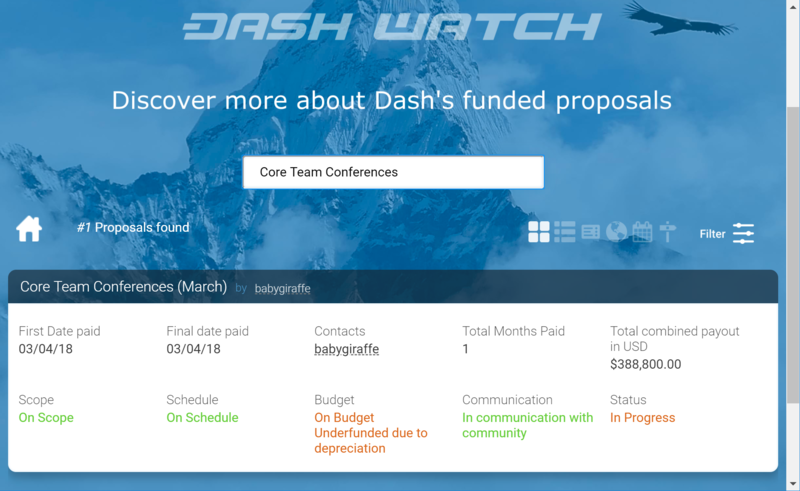 Finally, Axe Watch (which was itself funded through a budget proposal) exists to monitor the ability of blockchain contractors to deliver on their promises with respect to delivery dates and the total amounts of budget allocated over multiple voting periods. A team of dedicated staff routinely interact with proposal owners to track progress of the various projects and provide reports to voting masternodes in a single location. While providing data on the performance of your proposal to Axe Watch is optional, many masternode owners take advantage of the data they make available to make their voting decisions. The Axe Watch team may be contacted at team@axewatch.org email address or through their website. The total budget of the network can be calculated by taking 10% of the reward over the period of time between two superblocks, which occur every 16616 blocks or approximately 30.29 days. A voting cutoff occurs 1662 blocks before the superblock, and the final votes are tallied at this point. A proposal must satisfy the condition (YES votes - NO votes) > (Total Number of Masternodes / 10) in order to be considered passing. Then, in the superblock, the winning proposals are awarded in the order of the margin by which they are passing until either the entire budget is allocated or no more passing proposals exist. This allows for completely trustless and decentralized allocation of the budget. If a proposal has passed the voting threshold but insufficient funds remain to pay the full amount requested, it will not receive partial funding. Instead, any smaller proposals which have also passed the threshold that will fit in the budget will be funded, even if they have lower net approval than the larger proposal. Proposals requesting payment over multiple budget periods will remain in the treasury system for the duration of their validity, even if they do not pass the voting threshold, and even if insufficient budget is available for funding as described above. Any unallocated budget is simply never created in the superblock, reducing unnecessary inflation. Due to the decentralized nature of the masternode system, it is sometimes necessary to form funded organisations, such as committees or companies, to be responsible for some project or task. 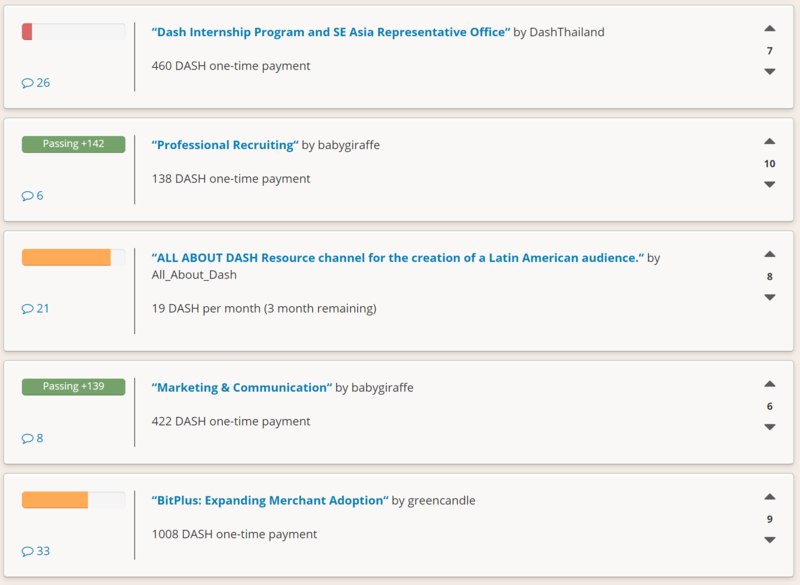 These are submitted in the same way, but the committee itself receives the funds. Another alternative is to place trusted escrow services between the budget allocation event and the actual submitter of the proposal to ensure that work is paid for in stages, as it is delivered. Some oversight over blockchain contractors is sometimes needed. Each budgeted item requires either a team manager or a committee responsible for implementation of the work. Periodically, this manager is expected to report on budget expenditure and completed work to show the value created from the allocated funds. This allows repeat proposal submitters to build up a reputation and gain trust from the community. Proposals which do not provide regular reports and cannot answer questions about their budget allocation will soon be defunded if it is part of a regular monthly proposal cycle. The result is a kind of self-policing system. As the number of blockchain contractors increases, a point is reached where masternode operators cannot be realistically expected to evaluate the volume of proposals. At this point funding organizations can be created to act as contractors for the distribution of funds to many smaller decentralized projects, according to current needs. Axe Core Group, Inc. is one example of such an organization. The existence of the decentralized budget system puts the power of determining where Axe goes in the future in the hands of the masternode network itself. All core development and several peripheral developers are already funded from the budget, and other projects not even conceivable at this time will likely arise in the future. This decouples the survival and value of the blockchain from the current userbase and developers, making Axe the first blockchain designed to outlive its original users, a self sustainable decentralized cryptocurrency network that can still operate cohesively and bring added value services to end users in a consistent way. Every masternode operator establishes a bond of trust and a social contract with the network in which she is bound to contribute to the development and maintenance of the ecosystem she benefits from. Under this model, a portion of the funds that the operator is bound to receive are in a sense allocated in custody, not in ownership, and are held in escrow by the network to be executed by the operators for the benefit of the ecosystem. Everyone contributes equally and proportionately to the benefits they are receiving and the risks they are taking, there are no privileges and no loopholes. This is complemented by the full node voting mechanism that allows for a distributed group to vote on a continuous basis on practical matters without the need to forfeit their right to decide to others, every few years, like with traditional governments or cooperative corporations. We envision a future in which this model of transparent, unbreakable and verifiable contribution to the common good, in combination with continuous participation of the crowd through active voting, is utilized to manage organizations that are owned or operated jointly by its members, who share the benefits and responsibilities of those collectives, like governments, cooperative corporations, unions, DAOs, cryptocurrencies, etc. We call this model decentralized governance by blockchain.